Newly updated! The second edition has tons of all-new information: parallax effects, responsive images, responsive typography, updated plugins, updated jQuery code, and more! Designer-oriented. Written just for designers – no developer jargon or dense explanations you’ll never understand. Easy to understand. Each exercise is clear and concise and walks you through step-by-step showing exactly what you need to do and explaining why. Code Examples. Sample code available for every exercise in the book. You’ll always have working code to use as a reference while you learn. Steps you through each task and provides helpful information to take the anxiety out of learning to code. Clear and concise, design-centric tutorials teach you jQuery without getting bogged down in jargon. Create popular effects like animated slideshows, parallax scrolling effects, responsive design, and more! Get started learning jQuery today! 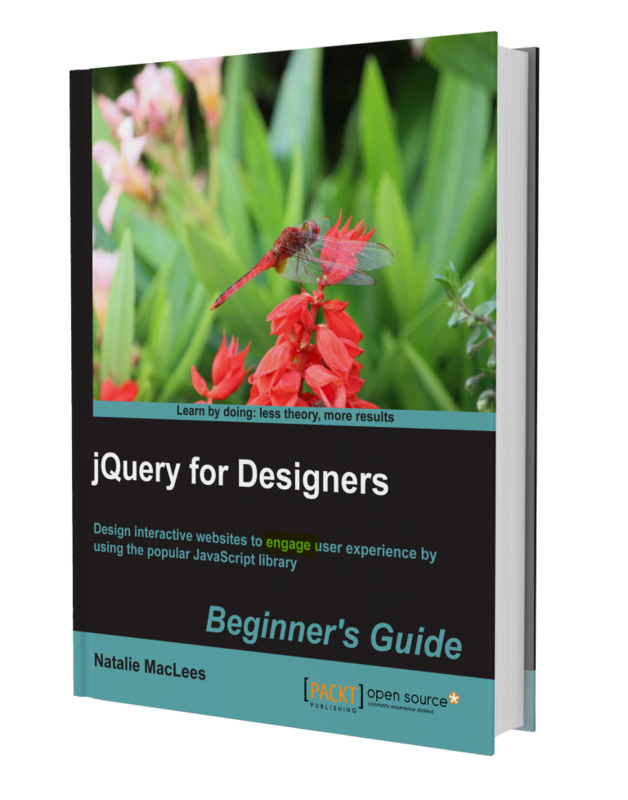 jQuery for Designers is a gentle and approachable introduction to learning to create interactive page elements with jQuery. The book’s promises are correct. The book covers everything the cover and introduction said it will tell you…After reading this book I learned a lot to put jQuery into practice on every day sites and jobs. This book is not written for those who want to develop their own jQuery plugins but instead its written for web designers who would like to know how to implement every day features on their site. Natalie MacLees does a brilliant job of getting the momentum going and teaching you the essentials and best practices to make your way into this critical part of the web today. She doesn’t waste her time with diatribes, and instead focuses on teaching the fundamentals and critical time-saving methodologies — like employing plug-ins in your projects. Designers Learning jQuery Episode 13: Animating Color from Natalie MacLees on Vimeo. A look at what no conflict mode is, why we'd use it, and how to use it best. Designers Learning jQuery Episode 12: No Conflict Mode from Natalie MacLees on Vimeo. A look into the magical and mysterious jQuery objects - the heart of the jQuery library. Designers Learning jQuery Episode 11: The jQuery Object Explained from Natalie MacLees on Vimeo. Designers Learning jQuery Episode 10: If an Element Exists from Natalie MacLees on Vimeo. Designers Learning jQuery Episode 9: Animated Tabs from Natalie MacLees on Vimeo. Designers Learning jQuery Episode 8: Parents and Children from Natalie MacLees on Vimeo. Designers Learning jQuery Episode 7: Built-in jQuery Animations from Natalie MacLees on Vimeo. Designers Learning jQuery Episode 6: jQuery Accordion from Natalie MacLees on Vimeo. Designers Learning jQuery Episode 5: DOM Traversal from Natalie MacLees on Vimeo. A look at how to create simple jQuery tabs without using a plugin - and a few quick lessons and tips to help you along. Designers Learning jQuery Episode 4: jQuery tabs without a plugin from Natalie MacLees on Vimeo. A gorgeous way to create responsive charts and graphs that even includes some nice animations!